Broadcaster Press 11 October 30, 2018 www.broadcasteronline.com Palmer Amaranth: A Growing Concern In South Dakota BROOKINGS, S.D. - Although Palmer Amaranth can be found in South Dakota, it is currently not wide spread. SDSU Extension staff say it may be possible to limit the scope and economic burden this weed could cause if South Dakota producers and agronomists are vigilant throughout harvest and into 2019 growing season. "If producers come across a patch of Palmer Amaranth in their fields during harvest, they should consider bypassing those areas," said Ruth Beck, SDSU Extension Agronomy Field Specialist. Beck explained that combining mature Palmer Amaranth or other pigweeds is not recommended. "However, if combine harvest cannot be avoided, leaving those areas till last will help keep from moving these weeds to other fields or spreading them further in the field where they are found," Beck said. Before leaving the infested area, harvest equipment should be thoroughly cleaned. And, to improve control measures in 2019, Beck encourages producers to make note of infested areas. "Those areas will need to be treated with a strong preplant/preemerge herbicide program and a follow-up post emerge application next year," said Paul O. Johnson, SDSU Extension Weed Science Coordinator. Using herbicides with long residuals and multiple modes of action is recommended. Field management practices to control Palmer Amaranth If Palmer Amaranth is found in a field this fall, Beck outlined some best management practices to help control the weed. No-till: Managing infested areas of the field with no-till will keep seeds on the surface where they are exposed to weather extremes and predation from birds and insects. Whereas, shallow tillage favors germination. Crop rotation: Crop rotations that include wheat, corn and milo will give producers more control options. Zero tolerance: It is recommended that producers employ a zero tolerance ap- proach to controlling this weed. This may include hand removal of escapees. "Keeping the field clean until the crop canopies will help with control of this weed," Beck said. "Emergence will drop significantly after crop canopy." Palmer Amaranth ID tips Palmer Amaranth was introduced to South Dakota through seed, equipment, feed and manure. It is a versatile weed whose male and female parts exist on different plants, so, it needs to cross pollinate to produce seed, explained Johnson. "The process of cross pollination increases the plants genetic diversity and its ability to develop plant types that are resistant to herbicides," Johnson said. A prolific seed producer, Palmer Amaranth has the ability to germinate for an extended period during the summer, grow quickly and compete aggressively with crops for nutrients, light and moisture. It is difficult to identify Palmer Amaranth from other pigweed species when the plants are small. However, Palmer does have some unique features and these will become more obvious as the plant ages, said Gared Shaffer, SDSU Extension Weeds Field Specialist. Stem: The stem of Palmer is smooth, where other pigweeds, such as redroot pigweed has hairs. Leaves: Although waterhemp also has a smooth stem, its leaves usually have a narrow lanceolate shape versus Palmer Amaranth which has leaves that are more diamond shaped or broader across. Petiole: Another feature unique to Palmer Amaranth is a long petiole. Spiny bract: Palmer amaranth can have a spiny bract where the petiole attaches to the main stem. This spiny bract is not common in redroot pigweed or in waterhemp. "Once Palmer Amaranth develops a seed head it becomes easier to distinguish, as the terminal seed head is usually very long," Shaffer said. Resources & Considerations Scholarship Prizes Available When Making Cull Cow For Resource Conservation Marketing Decisions Speech Contest Winners BROOKINGS, S.D. - With cull cow markets below average this fall, SDSU Extension Livestock Business Management Field Specialist, Heather Gessner shares resources and considerations cattle producers should review when deciding when to market cull cows. "The 2018 slaughter cow market has been impacted by the large supply of beef in storage and an increase in cow slaughter volume compared to 2017," said Gessner, pointing to the South Dakota 2018 slaughter cow prices which are at or below 2017's average monthly prices (Figure 1). The Livestock Marketing Information Center 2018 average through September for breaker grade cows was $65.05. "This is 4.3 percent lower than 2017," Gessner said. 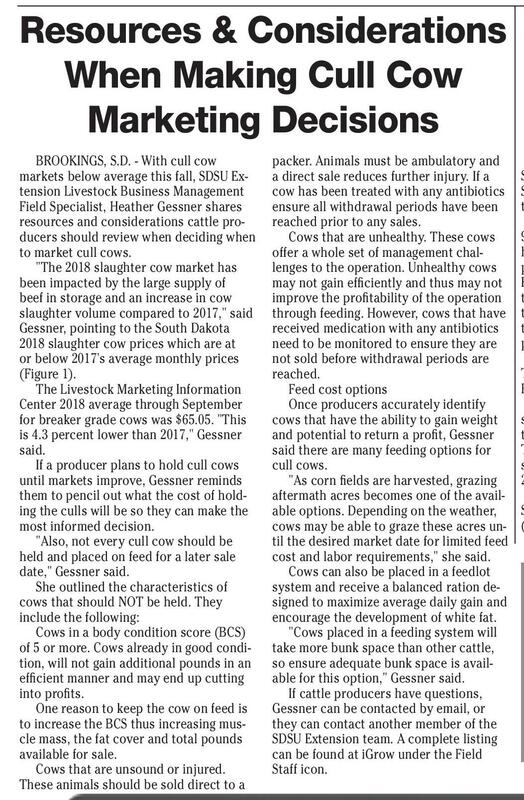 If a producer plans to hold cull cows until markets improve, Gessner reminds them to pencil out what the cost of holding the culls will be so they can make the most informed decision. "Also, not every cull cow should be held and placed on feed for a later sale date," Gessner said. She outlined the characteristics of cows that should NOT be held. They include the following: Cows in a body condition score (BCS) of 5 or more. Cows already in good condition, will not gain additional pounds in an efficient manner and may end up cutting into profits. One reason to keep the cow on feed is to increase the BCS thus increasing muscle mass, the fat cover and total pounds available for sale. Cows that are unsound or injured. These animals should be sold direct to a packer. Animals must be ambulatory and a direct sale reduces further injury. If a cow has been treated with any antibiotics ensure all withdrawal periods have been reached prior to any sales. Cows that are unhealthy. These cows offer a whole set of management challenges to the operation. Unhealthy cows may not gain efficiently and thus may not improve the profitability of the operation through feeding. However, cows that have received medication with any antibiotics need to be monitored to ensure they are not sold before withdrawal periods are reached. Feed cost options Once producers accurately identify cows that have the ability to gain weight and potential to return a profit, Gessner said there are many feeding options for cull cows. "As corn fields are harvested, grazing aftermath acres becomes one of the available options. Depending on the weather, cows may be able to graze these acres until the desired market date for limited feed cost and labor requirements," she said. Cows can also be placed in a feedlot system and receive a balanced ration designed to maximize average daily gain and encourage the development of white fat. "Cows placed in a feeding system will take more bunk space than other cattle, so ensure adequate bunk space is available for this option," Gessner said. If cattle producers have questions, Gessner can be contacted by email, or they can contact another member of the SDSU Extension team. A complete listing can be found at iGrow under the Field Staff icon. PIERRE, S.D. – Contestants in the 2019 State Finals of the Resource Conservation Speech contest will be eligible to win a total of $2,300 in college scholarships. All South Dakota students in grades 9-12 are eligible to compete for $2,300 in higher education scholarships, which are provided by East River and Rushmore Electric Power Cooperatives, as well as the South Dakota Rural Electric Association. Scholarships are awarded to the top three finalists: first place is $1,100, second place is $750 and third place is $450. The theme for the 2019 contest is “Ag Technology: Farming & Ranching for a Future.” Contests are coordinated by local conservation districts. Local winners advance to area contests held in seven locations. The top area speakers compete at the state finals in Pierre on Saturday, April 27, 2019. 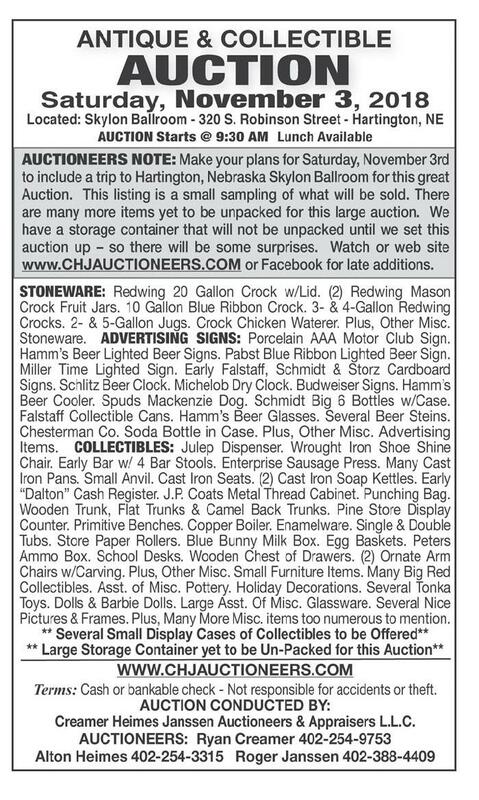 The contest is sponsored by the South Dakota Department of Agriculture (SDDA), in cooperation with Touchstone Home of Great Ideas since 1934 201 W Cherry St. • Vermillion, SD Phone: 624-4429 • Fax: 624-2696 BroadcasterOnline.com ACREAGE AUCTION Reuse. Repurpose. Really Save! Take a fresh look at the Classifieds, the original way to shop green! 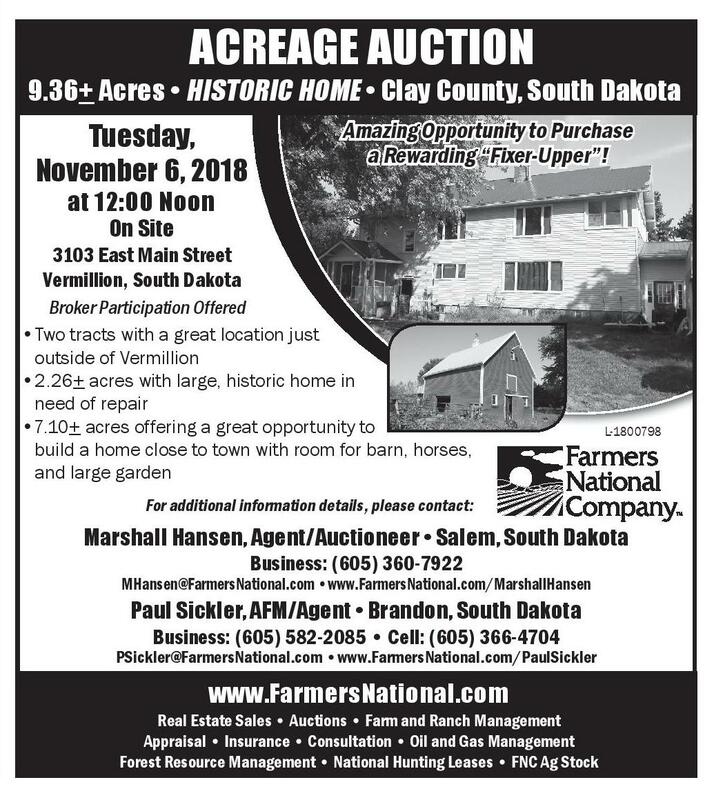 9.36+ Acres • HISTORIC HOME • Clay County, South Dakota Tuesday, November 6, 2018 Amazing Opportunity to Purchase a Rewarding “Fixer-Upper”! at 12:00 Noon On Site 3103 East Main Street Vermillion, South Dakota Broker Participation Offered • Two tracts with a great location just outside of Vermillion • 2.26+ acres with large, historic home in need of repair •7.10+ acres offering a great opportunity to build a home close to town with room for barn, horses, and large garden L-1800798 For additional information details, please contact: Marshall Hansen, Agent/Auctioneer • Salem, South Dakota Business: (605) 360-7922 MHansen@FarmersNational.com •www.FarmersNational.com/MarshallHansen bp Since 1934 Paul Sickler, AFM/Agent • Brandon, South Dakota Business: (605) 582-2085 • Cell: (605) 366-4704 Broadcaster Press 201 W Cherry Vermillion 624-4429 bp roadcaster Since 1934 B Press PSickler@FarmersNational.com •www.FarmersNational.com/PaulSickler www.FarmersNational.com Real Estate Sales • Auctions • Farm and Ranch Management Appraisal • Insurance • Consultation • Oil and Gas Management Forest Resource Management • National Hunting Leases • FNC Ag Stock Energy Cooperatives of South Dakota, the U.S. Fish & Wildlife Service and the South Dakota Association of Conservation Districts. 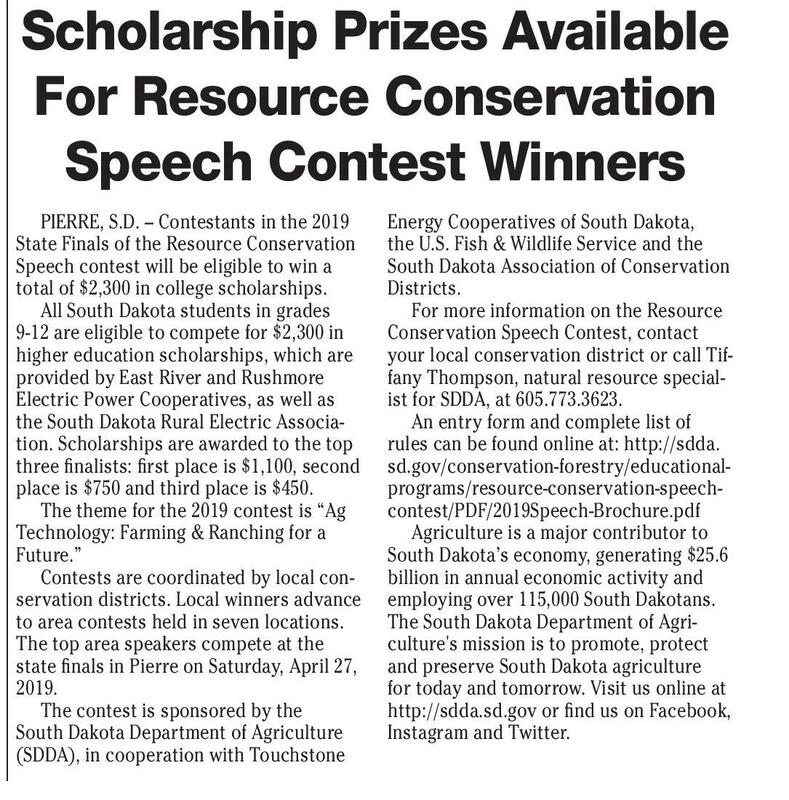 For more information on the Resource Conservation Speech Contest, contact your local conservation district or call Tiffany Thompson, natural resource specialist for SDDA, at 605.773.3623. An entry form and complete list of rules can be found online at: http://sdda. sd.gov/conservation-forestry/educationalprograms/resource-conservation-speechcontest/PDF/2019Speech-Brochure.pdf Agriculture is a major contributor to South Dakota’s economy, generating $25.6 billion in annual economic activity and employing over 115,000 South Dakotans. The South Dakota Department of Agriculture's mission is to promote, protect and preserve South Dakota agriculture for today and tomorrow. Visit us online at http://sdda.sd.gov or find us on Facebook, Instagram and Twitter.